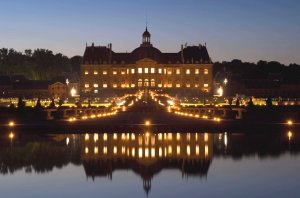 At night, the Castle and the gardens of Vaux le Vicomte are illuminated by 2000 candles to recreate the atmosphere of the festivities held by Nicolas Fouquet on August 17th, 1661 in honor of Louis XIV. Classical music is displayed in one area of the gardens. A champagne bar in the gardens will contribute to celebrate this wonderful moment of refinement. Possibility to have dinner in the restaurant Les Charmilles located in the gardens. New this year: Fireworks will be fired on the 1st and 3rd Saturday of the month during candlelights evenings around 10:30-11p.m.